Congratulations to Benjamin Scholl, Winner of Event 20: $5,000 Limit Hold'em ($206,760)! It took almost 27 hours and hundreds of min-raises, but finally Benjamin Scholl has been crowned the champion of Event 20: $5,000 Limit Hold’em. For that effort, Scholl goes home with all the glory, $206,760 in cash and of course the World Series of Poker gold bracelet. When the day started, 17 players all had high hopes of being where Scholl stands right now, but only one could prevail. The first elimination of the day occurred during the first half of the very first level, with Ron Burke finding the rail in 17th place. From there it was Mike Schneider who finished in 16th, Douglas Rutherford in 15th and Kenneth Shei in 14th. At this point Terrence Chan was slowly losing his chip stack as Chris Overgard was railed in 13th place. Eventually Chan would bow out in 12th when he couldn’t manage to run his short stack back up. The elimination of Matt Szymaszek in 11th place would send us to our unofficial final table of ten and the quick exit of Samuel Golbuff in 10th place would see us arrive at the official final table. Leading the final table was prominent player Jeff Shulman and the talk of the town was the fact that Jeff’s father Barry Shulman was simultaneously on the final table of Event 19: $1,500 No-Limit Hold’em. Jeff would end up doing better than his father, who finished in 8th place, but that’s jumping ahead. The first player to hit the rail at the final table was Ayman Qutami in 9th place, with his exit followed closely by Nicholas Derke in 8th. It was Andrew Prock who eliminated both of these players and so it was he who stole the chip lead from Shulman. However, Shulman managed to get the lead back as Matthew Woodward was eliminated in 7th place, Matt Glantz bit the dust in 6th and Raymond Dehkharghani in 5th. Shulman’s four-handed chip lead wouldn’t last for long as Jesse Martin’s elimination in 4th place would also see Shulman’s stack start to dwindle. Shulman was almost down and out a few times, but clawed on to life multiple times to make a comeback. Shulman hung on to dear life as three-handed play marched on for multiple hours. Eventually Shulman's run would come to an end though, as he found the rail in 3rd place. Going into heads-up, Benjamin Scholl held an almost four-to-one chip lead and it wouldn't take him long to overcome Andrew Prock. Eventually the last hand of the night played out and with that, Prock went home as the gallant runner-up, while Scholl takes home his first WSOP gold bracelet. Thanks for tuning into our coverage of Event 20. 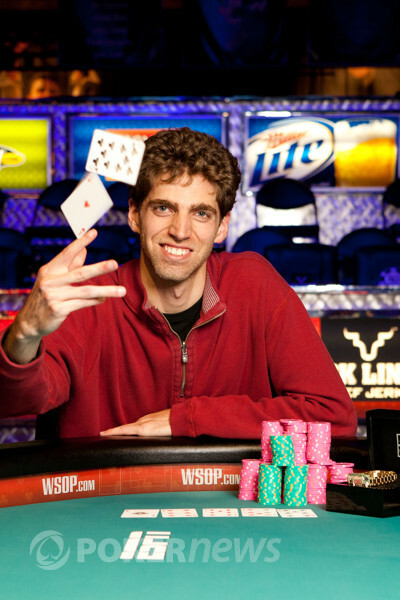 There will be plenty more to come at the 2012 WSOP, so make sure to return to PokerNews to find out who joins Benjamin Scholl as the next gold bracelet winner. After a long and tumultuous ride, the last hand of the tournament has now played out and this is how it went down. Benjamin Scholl raised the button and Andrew Prock promptly made it another bet to go. Scholl flicked in the call and a flop was spread along the felt. Prock led on the flop and Scholl called as a hit the turn. It was here that Prock committed his last 15,000 in chips and with a call from Scholl, the players turned their hands over. Prock needed to catch a three on the river, but it wasn't meant to be as a completed the board to send Prock home in 2nd place. 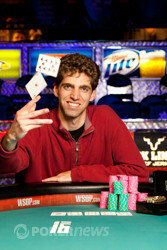 That means that Benjamin Scholl is our latest World Series of Poker gold bracelet winner! Andrew Prock is on his last legs here in Event 20. A recent hand saw Benjamin Scholl open the button and Andrew Prock call in the big blind. The flop would see Prock check-raise and Scholl call as a hit the turn. This time Prock would lead and then call the raise of Scholl. Both players checked the river and and Scholl's would be too strong for Prock's . With that hand, Prock is left with just a couple of big bets. Benjamin Scholl has take down a few small pots without contest early to edge closer to a victory. 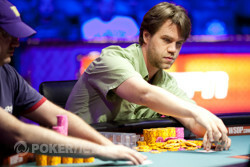 As you can see, Benjamin Scholl starts the heads-up battle with a substantial chip lead. Let's see how this turns out. 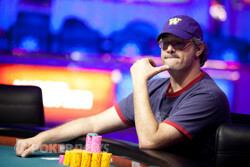 The last hand of the 3rd-place finisher has finally occurred, with Jeff Shulman the latest player to head to the rail. It started when Shulman raised it up on the button. Benjamin Scholl called in the big blind and a flop was dealt. Scholl opted to check-raise here and Shulman made the call. The turn then saw Shulman and Scholl put in enough bets to see Shulman's last chips enter the pot. When Shulman tabled his he was looking very good to double-up and survive against the of Scholl. However, fate had other ideas as a on the river would send Scholl the pot and Send Shulman home with a bittersweet $92,562. The rail is back and singing as Andrew Prock has raked in a pot to pick up some new chips. It started when Jeff Shulman raised in the small blind. Prock called in the big blind and a flop was spread along the felt. Shulman opted to check-call a bet from Prock here and then do the same on the turn ( ) and the river ( ). When it came to showdown, Prock tabled his , with his turned two-pair sending Shulman's cards into the muck. Andrew Prock's chorus of railbirds may stop singing soon if Prock continues loosing chips. A recent hand saw Prock raise the button. Jeff Shulman then made it three bets out of the big blind and Prock called. On the flop, Shulman led and Prock called. The turn and Prock would end up leading as Shulman check-called. The on the river would see both players check and Shulman turn over , enough to take the pot away from Prock. Jeff Shulman opened up the button and Andrew Prock three-bet from the small blind. Shulman then made it four bets to go and Prock called. The flop would see Prock check-call a bet from Shulman and then both players checked down the turn ( ) and the river ( ). Shulman's was strong enough to trump the of Prock as he raked in the pot.